The stay-at-home mothers get the SHAFT from journalists and MPs too often. These are but a few examples of the discrimination now plaguing some parents (mostly mothers) in Australia. ‘”Paid parental leave is an important economic reform, very important economic reform, that will boost participation and productivity,” Abbott said this week on ABC’s AM program’. Tony Abbott: ‘If female participation in Australia were 6 per cent higher, at Canada’s level, GDP would be higher by $25 billion a year”. Imagine how much richer we’d be if we climbed 16 per cent higher to reach Iceland’s level’. ‘The happy wife is a full-time domestic goddess ministering to the every need of her perfect (and good job-holding) husband and her brood of adorable kids’. ‘Currently 58.4% of all adult women participate in the labour force (ie. as workers, or looking for work); compared with 70.9% of adult men. The reason for the gap is because of the decline in participation of women aged 25-34 compared to men’. ‘International research confirms that 80 per cent of a child’s development happens in the first three years of life. By the age of four, 92 per cent of the brain is formed. If children aren’t being spoken to enough, are not being exposed to different types of stimulus or if they’re spending too much time in front of a television screen, their long term educational outcomes are compromised’. ‘In this country, more than most others in the advanced world, caring for the home and for children is still considered a predominantly female occupation’. ‘Single income families get only one tax-free threshold whereas dual income families get two tax-free earnings of $18,000 for each partner’. ‘Another discriminatory policy is Prime Minister Tony Abbott’s Paid Parent Leave which offers mothers in the paid workforce their full salary for six months of maternity leave up to a total of $75,000. The money is to be obtained by a l.5% levy on big companies. Single-income families are discriminated against not only because they do not get the maternity leave payments but also because the tax cuts to big companies to cover the cost of the PPL levy will come out of the pockets of taxpayers’. ‘Mr. Abbott and Mr. Hockey, stop discriminating against mothers and their children on the basis of the mother’s paid-workforce status. Government payments should be focused on the well-being of children and not on preferential treatment for career women. And if there are any disgruntled feminists who object to such equitable policies, just offer them the title of “Duchess” or “Countess”. This should keep them happy for a while’. The stay-at-home mum had quite the heyday for a while, but Tony Abbott has turned his back on the band of women his party once championed…. She is the Australian stay-at-home mum. Of all the fascinating reinventions Tony Abbott has undergone over the years, nothing is quite so intriguing as the way his legislative taste in women has changed. When he was sworn in, pledging to assist “women struggling to balance work and family”, it confirmed what his epiphany on paid parental leave had already suggested; the model Abbott mum is now an employee, not a homemaker. Australia’s employment rate for mothers is the lowest of all the countries in the OECD at 62%. Universal paid parental leave is a critical strategy in encouraging new parents to stay in the workforce and achieving the G20 goal of increasing women’s labour force participation by 25% by 2025. There is compelling evidence of health and welfare benefits for mothers and babies from a period of postnatal absence from work for the primary caregiver of around six months. Australian guidelines and the World Health Organisation recommend that infants are fed nothing but breast milk for their first six months of life and continue to be breastfed into their second year. Exclusive breastfeeding ensures that babies receive the full nutritional and development benefits as well as protection against infection and some chronic disease. I’m concerned over the downgrade given to women (and some men) who choose to remain at home to raise their children. So, I wrote this email letter to Queensland Senator Barry O’Sullivan on 15 May 2015. I have become disillusioned by what the Coalition federal budgets for 2014 and 2015 are doing to mothers who are not in the out-of-home workforce. You are talking up the need for mothers to get back to work. I’m a long-term family counsellor and I’ve seen the many deleterious consequences of what this does to families. Do you realise how many stay-at-home mothers there are who could swing an election, especially when the Coalition gives them the SHAFT like it has in the last 2 budgets? Notice the second last line where for 2009-10 it indicates that ’employed mothers in couple families with children’ were 66% of mothers. That means that the remainder – 34% of unemployed mothers with children, i.e. stay-at-home mothers – are the ones who have been forgotten. They have been given a kick in the guts by the Abbott-Hockey government. They could swing an election result. One-third of mothers are stay-at-home people. But your Coalition government have not been fair with them. They have not been treated with justice in the 2014 and 2015 Coalition budgets. Making the single-income household equitable. At the moment a single-income family with $120,000 income pays approx. $10,000 more tax than a two-income family what has a joint income of exactly the same amount – $120,000. This could be repeated across various levels of income. THIS IS UNFAIR AND SINGLE INCOME FAMILIES ARE OR SHOULD BE EXASPERATED by what the Coalition is doing to them. THIS VIOLATES FAIRNESS AND JUSTICE. All Aussie families deserve to be treated with equity. What would be a fairer way? Bring in legislation for income splitting so that, based on this example, the two adults in the household would earn $60,000 each and EACH would benefit from the tax free threshold. I urge you to read the research on the impact of a mother’s love on a child. See, ‘How a Mother’s Love Changes a Child’s Brain‘ (Live Science, January 30, 2012). This research found that ‘Nurturing a child early in life may help him or her develop a larger hippocampus, the brain region important for learning, memory and stress responses’. When will you as a Coalition acknowledge that the uniquely close relationship between a mother and her baby is critical for the baby’s development? Please tell me what you will do to bring equity into families with a taxation system of fairness to stay-at-home mothers, starting from this budget? Thank you for seeking my views on same-gender marriage. As you would be aware, our party has a long standing party position on this issue and we have consistently shared this position with voters. My party’s position is completely in accord with my own personal position. Keeping in line with LNP policy, I have staunchly told my parliamentary colleagues, fellow party members, media and the public that I will oppose any measures by parliament to alter the timeless definition of marriage as being between a man and a woman. I believe the strength or weakness of marriage as a social institution profoundly affects the well-being of everyone in society, especially children. The state should protect and promote marriage—notably the family unit, which is marriage in its fullest fruition—because it is a distinct and irreplaceable way that men, women, and children can flourish. The union of husband and wife is, on the whole, the most appropriate environment for rearing children. This is an ideal that is supported by the best available social science. Recognising same-gender relationships as marriages would legally abolish that ideal. It would remove the notion that men and women typically have different strengths as parents; that boys and girls tend to benefit from fathers and mothers in different ways. I also do not support a conscience vote on the issue of same-gender marriage. A conscience vote should only be reserved for matters of life, which this issue is not. As I travel across the state I do not experience the apparent voter interest in the same-gender marriage debate that is claimed in some sections of the media. Voters are instead focussed on the day-to-day issues such as the economy, cost of living, access to quality education, drought and infrastructure delivery. I strongly believe marriage between one man and one woman is critical to making a positive contribution to maintaining social stability. Society as a whole pays a high price when marriage is devalued. Thank you for taking the time to write to me on this very important issue. I was not expecting such a concise and profoundly thought out response. May the Lord bless and encourage Senator O’Sullivan who is standing up for God’s view of heterosexual marriage. What is a Christian definition of when marriage begins? Anne Summers, ‘Abbott’s baby bonus in disguise’, The Sydney Morning Herald, 18 May 2013. Available at: http://www.smh.com.au/federal-politics/political-opinion/abbotts-baby-bonus-in-disguise-20130517-2jrmf.html (Accessed 23 June 2015). In Emma Alberici, ‘Female workforce participation: key is childcare, not babysitting’, The Canberra Times, 18 April 2015. Available at: http://www.canberratimes.com.au/comment/female-workforce-participation-key-is-childcare-not-babysitting-20150418-1mn86z.html (Accessed 23 June 2015). Anne Summers, ‘The tyranny of the white picket fence: Abbott government can’t be serious about encouraging women in the workforce’, The Sydney Morning Herald, 12 June 2015. Available at: http://www.smh.com.au/comment/the-tyranny-of-the-white-picket-fence-abbott-government-cant-be-serious-about-encouraging-women-in-the-workforce-20150612-ghlpop.html (Accessed 23 June 2015). Greg Jericho, ‘Abbott’s paid parental leave will do little to bring women to the workforce’, The Guardian, 10 March 2014. Available at: http://www.theguardian.com/business/grogonomics/2014/mar/10/abbotts-paid-parental-leave-will-do-little-to-bring-women-to-the-workforce (Accessed 23 June 2015). Sarah, ‘Dear Tony: The power of Australian women’, 13 May 2015. Available at: http://sarahsheartwrites.com/2015/05/13/dear-tony-abbott-the-power-of-the-australian-woman/ (Accessed 23 June 2015). Babette Francis, ‘An open letter to the Prime Minister and Treasurer’, OnLine Opinion, 15 April 2014. Available at: http://www.onlineopinion.com.au/view.asp?article=16215 (Accessed 23 June 2015). Annabel Crabb, ‘Abbott’s message to mothers: get to work’, ABC opinion, The Drum, 16 May 2015. Available at: http://www.abc.net.au/news/2014-05-14/crabb-so-long-howards-cherished-stay-at-home-mum/5452004 (Accessed 23 June 2015, emphasis in original). ACLW, ‘Statement sent to PM Abbott on support for the current Paid Parental Leave scheme’, 22 May 2015. Available at: http://leadershipforwomen.com.au/transform/statement-sent-to-pm-abbott-on-support-for-the-current-paid-parental-leave-scheme (Accessed 23 June 2015). This entry was posted in Government, Marriage & the Family on 23 June 2015 by spencer. What would you say to someone who said the following? Of the supreme God of the universe, ‘Superstition is not “complicated.” It’s the easy way out – it doesn’t require education, or deep thinking, just an unquestioning adherence to cultural traditions, and a clownishly arrogant willingness to explain the unknowable as if it were known’. Is the Christian faith superstition? ‘That is my opinion, yes. It is a very elaborate belief system, with a complex theology and a long history, but ultimately never ranges out from under the umbrella of “superstition”’. ‘I think it’s clownishly arrogant for people to purport to explain the unknowable as if it were known, which is what religion does about things like life after death, eternity, etc’. ‘If we want to understand the mysteries of the universe, the last thing we should do is unthinkingly embrace the explanations recorded in primitive Iron Age texts. Imagine if we did that in other areas of life (medicine, architecture, human rights). It’s 2015’. ‘An average student today knows more about the nature of the universe and of this world than the most learned sages of the Iron Age’..
‘Christianity relies upon Iron Age understandings of man’s origins and the nature of the world. It would be preposterous for us to apply that same primitive thinking to other areas of modern life (medicine, architecture, human rights), though some religious people attempt to in some areas’. ‘Christianity comes out of that primitive era, and unlike other fields of endeavor, philosophy, social systems, science – remains largely mired in Iron Age thinking’. ‘I was just referring to the persona or characteristics of the imaginary tyrant based on biblical descriptions – just as we ascribe certain characteristics or traits to the Greek gods, based on Greek mythology. The Christian god is a major league tyrant and sadist’. There you have a sample of an anti-Christian antagonist who has chosen to grace himself on a Christian Forum. Why would an anti-Christian want to even join with a group of Christians to stir the pot with his hostility towards and ridicule of the Christian faith? (2) They love showing up Christians who don’t know their product as well as they should. (3) For some, there is a considerable amount of arrogance displayed in trying to challenge Christians on what they believe. That’s what you’ll see in David’s responses if you care to follow that thread on the Internet. What do you think he would conclude? Here it is: ‘That is my opinion, yes. It is a very elaborate belief system, with a complex theology and a long history, but ultimately never ranges out from under the umbrella of “superstition”’. (2) He assumes it is superstition and therefore concludes that it is superstition. If he uses the second approach (which seems to be his demonstration in the first few posts), he is committing what is known as a question begging logical fallacy, which is also known as circular reasoning. It is circular because if one starts (belief in God is superstition) where one finishes (‘Superstition is not “complicated”’), one has gone nowhere except around in illogical circles. It has not dealt with the evidence about whether or not there is a supreme God. a. Premises in which the truth of the conclusion is claimed or the truth of the conclusion is assumed (either directly or indirectly). b. Claim C (the conclusion) is true. This sort of “reasoning” is fallacious [logically unsound] because simply assuming that the conclusion is true (directly or indirectly) in the premises does not constitute evidence for that conclusion. Obviously, simply assuming a claim is true does not serve as evidence for that claim (Dr Michael C Labossiere, The Nizkor Project, Begging the Question). So when David begins with a statement that belief in the supreme God is belief in superstition, he is not going to conclude differently unless he seriously addresses the evidence for the existence of the true God or no god. He has not demonstrated that in the Internet thread. He chooses not to engage with the evidence but to label it as ‘superstition’. This is a deceptive way to avoid getting into discussion about the evidence for God and Christianity. It’s a misleading way to avoid dealing with the evidence. A second of his examples above was: ‘I was just referring to the persona or characteristics of the imaginary tyrant based on biblical descriptions – just as we ascribe certain characteristics or traits to the Greek gods, based on Greek mythology. The Christian god is a major league tyrant and sadist’. ‘Christian god is a major league tyrant and sadist’. Again, he is using a question begging logical fallacy because he commences with god, ‘the imaginary tyrant’, moves to the parallel with the Greek gods and Greek mythology’ and ends with god labelled as ‘a major league tyrant and sadist’. He has provided not one piece of evidence to support his claims except using the throw-away line, ‘based on biblical descriptions’. He gives not one example in that post of any description from the Bible. ‘Quoting Dawkins’ claim about God and agreeing with it does not prove that his (or your) description of God of the OT is accurate. Please give us examples from the Bible (chapter and verse) on how each of these words apply (sic) to the character of God and we can discuss those passages in context to the entire Biblical narrative. Otherwise, Dawkins’ (or any other atheist’s) opinion about the Biblical God carries no weight in this discussion, at least with me’. This sort of “reasoning” is fallacious because mocking a claim does not show that it is false. This is especially clear in the following example: “1+1=2! That’s the most ridiculous thing I have ever heard!” (Dr Michael C Labossiere, The Nizkor Project, Appeal to Ridicule). Keep a watch out for the use of logical fallacies to derail an argument. It happens online, in personal conversation, and can be used by public speakers and those in the mass media. An excellent overview, with examples, of some of the major fallacies used to promote illogical answers is in The Nizkor Project: Fallacies. I urge you to review them and be able to identify them. I recommend that you learn to recognise these fallacies by name. As I respond to some of David’s replies, you will note that I try to identify his use of logical fallacies. What is a logical fallacy? Why should we even be concerned about people using logical fallacies in conversation or when they write? What is your response when a person doesn’t deal with the issues you are raising? They may give you the flick pass of avoidance, change the topic, reach a conclusion that is unrelated to the flow of the conversation, and may abuse you. Does that cause you to want to engage in discussion with them? Is it possible to have a rational conversation with people who do this? Politicians who face the media are experts at not answering the question asked and only giving the party line for that topic. What kind of fallacy is that? When someone uses such a fallacy, it is almost impossible to have a logical conversation with the one who is committing a logical error. He or she is being illogical in the discussion. When discussions become irrational – because of false logic – there is no way to get back on track until the matter is addressed. Let’s check on David again to see what he is up to. How does he attempt to derail a thread by other tactics? ‘Stand to reason? No. If we want to understand the mysteries of the universe, the last thing we should do is unthinkingly embrace the explanations recorded in primitive Iron Age texts. Imagine if we did that in other areas of life (medicine, architecture, human rights). It’s 2015. You start with ‘recorded in primitive Iron Age texts’ and then conclude, ‘Imagine if we did that in other areas of life’. That’s circular reasoning, a question begging logical fallacy. When you conclude with your premise that’s the essence of this kind of fallacy and you committed it. We cannot have a rational conversation when you do this. It’s a fallacious understanding. ‘Evolution was not recorded in Iron Age texts. Science does not rely upon the superstitions of ancient primitives, but religion often embraces them. “Religion comes from the period of human prehistory where nobody—not even the mighty Democritus who concluded that all matter was made from atoms—had the smallest idea what was going on. It comes from the bawling and fearful infancy of our species, and is a babyish attempt to meet our inescapable demand for knowledge (as well as for comfort, reassurance, and other infantile needs). Today the least educated of my children knows much more about the natural order than any of the founders of religion” (Christopher Hitchens)’. Here you are promoting another question begging logical fallacy. ‘least educated of my children knows more … than any of the founders of religion’. I see. Unless we redefine language in a smokescreen of tangled and tortured academic rhetoric, to the point of meaninglessness, “reasonable conversation” is not possible. I reject that notion. I’m sure that brand of mental gymnastics will go over well — and is even necessary — in defending a dissertation about the historicity of miracles in mythology, but in this casual setting, you might consider simply attempting to mount a plainly-worded counter-argument. If that’s possible. He’s scoffing at me and my replies (I’m only a couple of weeks away from defending my PhD dissertation and have mentioned it on the forum). He’s engaging again in the fallacy of ridicule. He’s not dealing with the issues I raise but ridiculing my views. Logical discussion cannot be pursued when a person does this and he needs to be challenged with the naming of his fallacies and showing how false illogic cannot be pursued to maintain a reasonable conversation. David is up to it again! I think it’s clownishly arrogant for people to purport to explain the unknowable as if it were known, which is what religion does about things like life after death, eternity, etc. I believe that mankind has some answers, and some partial answers, and that many things remain a complete mystery due to the infantile state of our science, and our still-feeble understanding of human psychology. Your ‘clownishly arrogant’ accusation (appeal to ridicule) and your other statements in this post indicate that your answers are restricted by your commitment to naturalism which you say includes ‘the infantile state of our science’. When you start with naturalism, that also includes ‘our still-feeble understanding of human psychology’ (your language), you will not include that which will open up mysteries of the naturalistic unknowable, life after death, eternity, etc. It will not allow you to consider how you can experience eternal life now and in the life to come. That needs you to be open to revelation from God through Scripture. That includes the testing of Scripture by the tests you apply to any literature to determine its reliability. (2) That will lead you to understand who you are and why you are here on earth. (3) It will tell you the rights and wrongs of values. How you should live morally will come from this openness to God and his revelation. (4) And have a guess what? This will tell you where you are going. There is life after death because God has revealed it as so. When you give up your naturalistic worldview (which does NOT require rejection of science), you will find that the revelation of the nature of the world through Scripture, fits like a hand in glove with reality. If there is no God and He has not revealed his plans for you, me and the universe, there is no ultimate reason for living. I find no meaning and purpose in life; there is no right or wrong in life except my shaky opinion. Then it doesn’t matter how you or I live. We can eat, drink and be merry for tomorrow we die. However, I urge you to consider the implications of your naturalistic worldview. It doesn’t prepare you for the Final Judgment (read about it in Matthew 25:31-46). I know you won’t like what I’ve said here, but your commitment to the restrictive world of naturalism, leaves a big hunk of your world blank. Thank you for considering these matters. ‘I consider this discussion an example of contrasting worldviews – in this case, Naturalism vs Theism’. If we can’t agree on whether we live in an open system where there is a spiritual element or a closed system where there is no spiritual dimension, there will be no agreement. Yes, this is a worldview issue of naturalism vs theism in this case between David and me. However, there is another dimension: Each worldview needs to be checked against the evidence. Or, to put it another way: How does a worldview compare with the comprehensive reality available to us? I consider that a major difference between David and me is that I want to examine the evidence available to me to reach a decision on whether that worldview matches reality. I’ve checked out naturalism, theism, pantheism, panentheism, atheism and agnosticism and I’ve found that the most comprehensive understanding of reality is Christian theism. I have an open approach to considering evidence. I don’t exclude any of these -isms, but I compare their content with the evidence. 2. Why there is evil in the world and how to deal with it. 4. Hope in life that prepares one for death. I have not found acceptable answers to these 4 questions in the other -isms. The Scriptures confirm two areas for obtaining information about our world and human life: (1) Creation – the created universe (see Romans 1:16-32; Psalm 19:1-6), and (2) Scripture (see 2 Timothy 3:15-17). You will never be able to handle the Rational worldview until you give up your logical fallacies of (1) superstition dressed as history, and (2) sophistry. It matters not at all to me whether you choose to participate in a rational examination of religious beliefs. But it’s unreasonable for you to assume or expect that rational people will redefine the language to accommodate your personal beliefs. Those are not logical fallacies that you mentioned. They are your presuppositions that you are imposing on me. We cannot have a rational discussion when you continue to use logical fallacies such as the one you use regularly here – the fallacy of ridicule. You have this added issue: ‘The person without the Spirit does not accept the things that come from the Spirit of God but considers them foolishness, and cannot understand them because they are discerned only through the Spirit’ (1 Corinthians 2:14). You will continue to ridicule Christians because you will not accept these things until Jesus changes you through repentance and faith in Jesus. I will continue to pray that the Lord will draw you to consider a holistic worldview that includes the dynamics of spiritual reality. This is fallacious reasoning for the reasons given above and you do it constantly against me. When will you wake up to what you are doing? I don’t fall for fallacious reasoning. When you make a statement like, ‘What good would a manmade religion be if….’, you are displaying your presupposition as your conclusion. Thus you are using a Begging the Question Fallacy. I hope that you will get to the point of giving up your use of logical fallacies against Christians and deal with the evidence for their beliefs. Let’s get something clear. You have NOT called my bluff. I’ve called you for your regular use of logical fallacies against me. But you won’t admit to what you are doing. For there to be ‘a reciprocal exchange’, there has to be an acknowledgement by both of us when we use illogical reasoning. Logical fallacies, which you use, are false reasoning. You won’t admit what you do when you are called on the specifics. I base my calling you for fallacious reasoning on the evidence you present. If you can agree to not use logical fallacies against others and me, we can have reasonable conversations. Up to this point, you have not admitted to this and your regular logical fallacies committed in your responses to me continue. Will you agree to quit doing that so that we can discuss the evidence rationally? This especially includes quitting your ad hominem fallacies and fallacies of ridicule against the Christian faith and me. Can we agree to not use logical fallacies and call each other on them when we use them? It seems to me that you are in such a habit of putting down the Christian faith by your use of logical fallacies that they come from you naturally without your giving too much thought to what you do. I could be wrong. Are you doing this, knowing what you are doing, to denigrate the faith of believers? It’s absurd for you to predicate all “logical discussion” here on me pre-emptively “admitting” your charges. I don’t admit to your all-inclusive list of fallacies because it is a wholly-subjective and self-serving means for you to discount the very essence of my arguments without addressing them. In other words, your litany of fallacies is not a reasonable critique. It is a rhetorical smokescreen to mask your unwillingness to engage on issues you presume to already know the truth about…. He doesn’t like being challenged with his use of fallacies and accuses me of not giving ‘a reasonable critique’. I’ve been very reasonable with him. I know of many people who would have verbally assaulted him for what he is doing to me. However, it does affirm that it’s impossible to have a rational conversation with him. ‘[Logical] Fallacies are common errors in reasoning that will undermine the logic of your argument. Fallacies can be either illegitimate arguments or irrelevant points, and are often identified because they lack evidence that supports their claim’ (20WL Purdue University, Logical Fallacies). Here you have resorted again to the Fallacy of Appeal to Ridicule against me. You don’t seem to be aware of how you shipwreck discussion with others and me by your use of logical fallacies. Luke was not an eyewitness, and if he spoke to eyewitnesses, we have no way of knowing. In fact, we don’t even really know who Luke himself was. The identity of the author of that gospel, and when it was written, remain conjecture. An effectively anonymous second-hand (at best) account of supernatural events is not “evidence” that satisfies legitimate historical scholarship, and so cannot be considered a refutation of anything. ‘Many have undertaken to draw up an account of the things that have been fulfilled among us, 2 just as they were handed down to us by those who from the first were eyewitnesses and servants of the word. 3 With this in mind, since I myself have carefully investigated everything from the beginning, I too decided to write an orderly account for you, most excellent Theophilus, 4 so that you may know the certainty of the things you have been taught’ (Luke 1:1-4 NIV). Luke has eyewitness accounts available to him. He had carefully investigated the issues and wrote an orderly account. So your view that they ‘are unsubstantiated’ is refuted by Luke’s evidence. There are criteria that historians use to determine historical veracity. When these are applied to Luke’s Gospel, they stack up well. ‘The gospels may be accepted as trustworthy accounts of what Jesus did and said. One cannot hope to prove the accuracy of every detail on purely historical grounds alone; there is simply not enough data available for that. But as investigation proceeds, the evidence becomes sufficient for one to declare that what can be checked is accurate, so that it is entirely proper to believe that what cannot be checked is probably accurate as well. Other conclusions, widespread though they are, seem not to stem from even-handed historical analysis but from religious or philosophical prejudice’ (Blomberg 12987:241). It seems to me that Blomberg has hit the mark with assessment of your views. They ‘seem not to stem from even-handed historical analysis but from religious or philosophical prejudice’. You start out as a skeptic of the truth and reliability of the Gospels and that is where you conclude. It’s a question begging fallacy. That is partly true. The Gospel originally was anonymous but from the latter half of the 2nd century and onwards it has been identified with Luke, the ‘beloved physician’ (Col 4:14) and the Apostle Paul’s companion. As for the date of writing, there are indicators. I Howard Marshall who has devoted extensive study to the Greek text (see his Greek Text commentary on Luke, Eerdmans1978) stated that Luke’s writing the Book of Acts before AD 70 (the fall of Jerusalem) indicate that ‘on the whole a date not far off AD 70 appears to satisfy all requirements’ for Luke (Marshall 1978:35). How reliable was Luke as an historian in his Luke-Acts documents? Others have gone before us who have assessed this. See, ‘Luke the historian in the light of research‘ (Dr A T Robertson). Luke’s accuracy in historical and geographical matters is so thoroughly established that to deny it would be pure folly. This fact has not always been recognized. In the mid-nineteenth century, a scholar named Eduard Zeller launched a severe attack on the historical accuracy of Acts. Among those who accepted his flawed conclusions was an eminent Scottish archaeologist named Sir William Ramsay. In fact, Ramsay led an archaeological expedition with the intention of proving that Acts was the error-filled product of a 2nd-century writer. It turned out, however, that Ramsay proved the opposite of what he had set out to prove. His years of research compelled him to describe Luke as “among the historians of the first rank” (St. Paul the Traveler and the Roman Citizen, p. 4). In 1897 he published his conclusions in the famous volume just referenced, in which he defended the proposition “that Acts was written by a great historian” (p. 14). Today, Luke is widely accepted as a remarkably accurate historian. The distinguished Roman historian A.N. Sherwin-White states: “For Acts the confirmation of historicity is overwhelming…any attempt to reject its basic historicity even in matters of detail must now appear absurd. Roman historians have long taken it for granted” (Roman Law and Roman Society in the New Testament, p. 189). Colin Hemer’s comparison of Luke with the well-known historian Josephus is telling: “The work of Luke is marked by carefulness but that of Josephus by carelessness” (The Book of Acts in the Setting of Hellenistic History, p. 219). Luke wrote of events that occurred over a geographical area ranging from Jerusalem to Rome, including such vastly diverse regions as Syria, Asia Minor, Greece, and Italy. His history spans a period of about 30 years in which the political and territorial situations were always changing. Boundary lines and political offices were in a constant state of flux. And Luke did not write in generalities; he did not omit technical details so as to avoid mistakes. Yet, his detailed references have proved to be accurate. Rackham observes that such accuracy as is found in the book of Acts would have been impossible for one writing 50 years later (The Acts of the Apostles, p. xliii). A similar example is found in Luke’s account of events in Thessalonica. The word Luke used in Acts 17:6 for “rulers” is a specific title: politarchs. This word is not used as an official title anywhere else in Greek literature. Consequently Luke was charged with using the wrong title to refer to these city officials. However, once again, Luke has been proved right and his critics wrong. Archaeologists have found a number of inscriptions that unquestionably prove that the term politarch was an official title of certain city officials in ancient Macedonia. One of these inscriptions was found on the ancient arch that spanned the famous highway leading into Thessalonica. On this arch there is a listing of seven names of magistrates who wore the title politarch. Luke’s historical accuracy has held up under the most intense and zealous scrutiny. All attempts to discredit this inspired author have themselves been thoroughly discredited’. David is out of step with the research on Luke and his credibility as a historian. His philosophical and anti-Christian scepticism are coming through. I’m going with the evidence and not with his presuppositions. You need to know these fallacies and call them by name. There is a significant need among Christians in a declining Christian culture to know their product – the Scriptures and Christianity. I urge you to call upon your church to establish courses in apologetics to address issues that you are likely to find at work, university or in the market place. As a good starter, try Norman Geisler & Frank Turek, Is Don’t Have Enough Faith to be an Atheist (2004). Apologetics courses deal with some of the major issues antagonistic to the faith. These include: (a) What is truth? (b) How do I know there is a God? (c) Why is there so much evil in the world and why doesn’t God stop it? (d) Is the Bible credible and reliable? (e) Why was it needed for a good man, Jesus, to die for sins? Why couldn’t God do that without the shedding of innocent blood? Please remember that it is only Jesus, through the Holy Spirit, who changes people from the inside out. Jesus saves! Human beings cannot save themselves and they need a proclamation of the Gospel in person or in a group. There is an urgent need to engage in proclamation of the Gospel. Blomberg, C 1987. The Historical Reliability of the Gospels. Leicester, England: Inter-Varsity Press / Downers Grove, Illinois: InterVarsity Press. Labossiere, M C 1995. Fallacies. The Nizkor Project (online). Available at: http://www.nizkor.org/features/fallacies/ (Accessed 8 June 2015). Stringer, J 2015. ‘Luke the Historian,’ in Answering Religious Error, April 3, Available at: http://www.answeringreligiouserror.com/inspiration/luke-the-historian/ (Accessed 20 June 2015). Christian Fellowship Forum, Public Affairs, ‘Superstition Vs. Eyewitness/Faith/Historical Document’, David Woodbury#1, June 1. Available at: http://christianfellowshipforum.com/ (Accessed 29 June 2015). Copyright © 2015 Spencer D. Gear. This document last updated at Date: 12 November 2015. This entry was posted in Agnosticism, Church & apologetics, Logic, Logical fallacies on 20 June 2015 by spencer. When does a person become a Christian? A person wrote: ‘Only faith “full belief” in Jesus Christ can provide salvation. Ask in your own way this is just a guide. “Dear heavenly Father I am sorry Christ had to take the punishment that I deserve.” “I ask you Christ that you please forgive me of all my sins. I thank you Lord for your wonderful grace and forgiveness’. That seemed a reasonable response from a Christian, but for for this one: It generated this provocative response : ‘At what point in this process does a person go from being a non-Christian to a Christian?’ I don’t quite know why this kind of response was necessary as the first person’s response was indicative of what happens when many come to Christ for salvation. Surely it is not difficult to determine this issue of when salvation begins. Acts 16:31 (ESV) states: ‘And they said, “Believe in the Lord Jesus, and you will be saved, you and your household.”’ ‘Believe’ is an aorist tense imperative (command) in the Greek. The aorist means instant point action so ‘believe’ here means that the moment a person believes in the Lord Jesus salvation is his or hers. To believe means to put one’s trust and confidence in Jesus Christ. ‘”To believe” always means to put all trust and confidence in the Lord Jesus, in other words, by such trust of the heart to throw the personality entirely into his arms for deliverance from sin, death and hell. Here epi [a preposition] is used; this trust is to rest on Jesus. This the jailor is to “do.” He must do the believing, every individual in his household likewise, for no one can do the believing for others. But faith is not our own production. Even in ordinary life confidence is awakened and produced in us by the one in whom we believe. The same holds true with reference to Jesus who is most worthy of our confidence and trust. To come in contact with him is to be moved to trust him and him alone for salvation. For this reason unbelief is such a crime. It is the refusal to trust him who is supremely worthy of trust’ (Lenski 2001:680-681, emphasis added).? Remember what the other fellow stated: ‘I ask you Christ that you please forgive me of all my sins. I thank you Lord for your wonderful grace and forgiveness’. I gather from that kind of statement that he is affirming, ‘Believe in the Lord Jesus’. So to answer your question: ‘At what point in this process does a person go from being a non-Christian to a Christian?’ On the basis of Acts 16:31 and the Philippian jailor, a person goes from being non-Christian to being Christian the moment that person believes and puts absolute trust and confidence in Jesus Christ for salvation. But elsewhere there are some conditions placed on this believing. Take John 3:16 (NIV) as an example: ‘For God so loved the world that he gave his one and only Son, that whoever believes in him shall not perish but have eternal life’. Here, ‘whosoever believeth’ (KJV) or ‘whoever believes’ (NIV) uses the present tense of the verb ‘believe’, meaning ‘continues to believe’. So, on the basis of this verse, a person who continues to believe ‘may continue to have eternal life’. To answer the question: a person becomes a Christian the instant he or she places faith/trust in Jesus Christ alone for salvation but we know that genuine faith by that person continuing to believe. And the inference will be that that person will continue to bear fruit that demonstrates genuine belief. Jesus said, ‘You will recognize them by their fruits’ (Matt 7:16 ESV). Therefore, we can conclude that any person who puts complete trust or confidence in Jesus Christ alone for salvation, will be saved from that moment. That faith will be demonstrated by: (1) Continuing to believe (and follow Christ), and (2) bearing fruits that demonstrate a person is a Christian. Lenski, R C H 2001. Commentary on the New Testament: The Interpretation of the Acts of the Apostles. Peabody, Mass: Hendrickson Publishers (based on the original published in 1934 by Lutheran Book Concern and assigned in 1961 to Augsburg Publishing House). Christian Forums, ‘Please understand’, January 8 2015, ddrgkd#1. Available at: http://www.christianforums.com/threads/please-understand.7859952/ (Accessed 16 June 2015). This entry was posted in Salvation, Sin on 16 June 2015 by spencer. On a semi-regular basis, I meet a fellow on a Christian forum who delights in condemning other Christians and me by his use of logical fallacies. Christianity comes out of that primitive era, and unlike other fields of endeavor, philosophy, social systems, science — remains largely mired in Iron Age thinking. Hence my perfectly reasonable comment — imagine if we relied upon primitive Iron Age thinking when it came to medicine, etc. Here he uses a question begging logical fallacy. When someone uses such a fallacy, it is almost impossible to have a logical conversation with that person who is committing a logical error. He or she is being illogical in the discussion. When discussions become irrational – because of false logic – there is no way to get back on track until the matter is addressed. This is your question begging fallacy again. Since you say Christianity ‘remains largely mired in Iron Age thinking’ you are inferring that ‘Iron Age thinking’ is what you will expect from Christianity today and you would NOT expect that to happen in medicine, etc. You will never be able to handle the Christian worldview until you give [up] your logical fallacies of (1) question begging and (2) ridicule. When will you admit your use of logical fallacies against Christians and a Christian worldview on this forum? I read your posts very carefully and I can see the fallacious reasoning. I’m no dummy when it comes to logic. Superstition is not “complicated.” It’s the easy way out — it doesn’t require education, or deep thinking, just an unquestioning adherence to cultural traditions, and a clownishly arrogant willingness to explain the unknowable as if it were known. Little children love fairy tales and mythology, so indoctrinating them from their earliest years pays dividends for a lifetime. Your ‘clownishly arrogant’ accusation (appeal to ridicule fallacy) and your other statements in this post indicate that your answers are restricted by your commitment to naturalism which you say includes ‘the infantile state of our science’. 2. That will lead you to understand who you are and why you are here on earth. 3. It will tell you the rights and wrongs of values. How you should live morally will come from this openness to God and his revelation. 4. And have a guess what? This will tell you where you are going. There is life after death because God has revealed it as so. When you give up your naturalistic worldview (which does NOT require rejection of science), you will find that the revelation of the world through Scripture fits like a hand in glove with reality. However, I urge you to consider the implications from your naturalistic worldview. It doesn’t prepare you for the Final Judgment (read about it in Matthew 25:31-46). There is another dimension: Each worldview needs to be checked against the evidence. Or, to put it another way: How does a worldview compare with the comprehensive reality available to us? I’ve checked out naturalism, theism, pantheism, panentheism, atheism and agnostism and I’ve found that the most comprehensive understanding of reality is Christian theism. I have an open approach to considering evidence. I don’t exclude any of these -isms, but I compare their content with the evidence. Has it occurred to you that one of the central purposes of a religion — more or less any religion — is to provide answers to life’s mysteries? Your list above would only be remarkable if Christianity didn’t provide answers to all of them. What good would a manmade religion be if it didn’t have an origin story, or didn’t have a plan for thwarting evil, or didn’t give purpose to life, or didn’t give hope in life, or didn’t make one feel better about our inescapable deaths? Islam answers those 4 questions. So do various Native American religions. So does Judaism, which doesn’t hold that Christ is the messiah. ‘The bible is the word of God, because God has revealed to us that it is. Where did he reveal it to us? In the bible’. This is fallacious reasoning for the reasons given above. c. eternal life or eternal damnation. Can people KNOW they have eternal life in this life? Does a Christian experience eternal life NOW? Christians also are capable of using logical fallacies in their discussions. See my article, Christians and their use of logical fallacies. I highly recommend the site, The Nizkor Project, that includes a list and explanation of the many logical fallacies with exposition by Michael Labossiere (1995). Christian Fellowship Forum, Public Affairs, ‘Superstition Vs. Eyewitness/Faith/Historical Document’, David Woodbury #37, June 6, 2015. Available at: http://christianfellowshipforum.com/ (Accessed 8 June 2015). Christian Forums is a very large forum at: http://www.christianforums.com/. I’ve encountered some who use various fallacies on this forum, but especially the red herring fallacy and the straw man fallacy. On this forum I normally hang out among Baptists, Salvation (Soteriology), Soteriology debate, and Christian Apologetics as OzSpen. This entry was posted in Agnosticism, Logic, Logical fallacies, Presuppositions, Worldview on 8 June 2015 by spencer. How bad is the teaching and practice of grammar by our school teachers? Is grammar no longer important? TEACHERS are no longer the “font of all knowledge”, challenged by devices such as iPads and phones in the modern classroom. Students are instead becoming more challenging to teachers, Australian Secondary Principals Association executive director Rob Nairn told a meeting of more than 200 principals and deputies. “We are dealing with a totally different beast,” he said. “Gone are the days when a teacher stands at the front of a classroom and are seen as the font of all knowledge … teachers have become facilitators of ideas and learning” (Vonow 2015). Read the beginning of that last paragraph again: ‘Gone are the days when a teacher stands at the front of a classroom and are seen as the font of all knowledge’. Could the problem be with teachers who don’t know the difference between singular and plural? In this sentence, Nairn spoke about the singular, ‘a teacher’, but referred to that person by the plural ‘are seen’. In such a fundamental area as this, perhaps this executive director of a Principals’ Association needs to re-learn some basic grammar. Who is making this statement? He is the Australian Secondary Principals’ Association executive director, Rob Nairn, and he said this to an audience of school principals. This is a shocking example of failed grammar in action. ‘is Executive Director of the Australian Secondary Principals Association (ASPA Ltd) and Associate Professor at Edith Cowan University. He has extensive experience in metropolitan and regional Senior High Schools in Western Australia particularly in low socio economic areas and is passionate about ensuring that high quality secondary education is provided to every young person no matter what their geographic, social or personal circumstances. With this kind of experience and reputation, I find it incomprehensible that such a person could violate such a fundamental piece of English grammar as knowing that a singular subject requires a singular verb to modify it. How can students expect to give correct grammatical answers when a prominent teacher got it so wrong? A mother of a primary school student in Grade 5 at a Queensland state school shared this photograph with me from her daughter’s homework book. You might get a giggle out of it, but it is serious when a text book and a teacher can get it so wrong. (1) Notice the task for the children to do: ‘The spelling mistakes in these sentences have been underlined. Write the correct spelling for each underlined word in the box’. It should have stated: ‘The grammatical mistakes in these sentences have been underlined. Write the correct grammar for each underlined word in the box at the end of the sentence’. (2) The student couldn’t see the ‘spelling’ error, so she decided to correct the grammar instead. The teacher’s correction is in handwriting to the right of the handwritten, ‘have’. 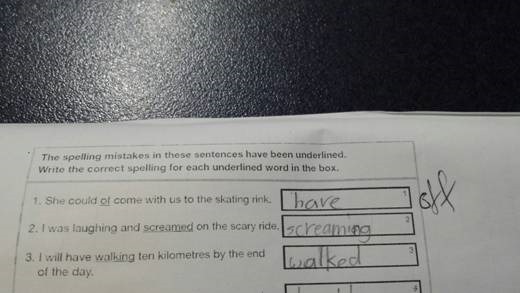 So instead of the sentence reading, ‘She could of come with us to the skating rink’, this teacher corrected the student so that the sentence would read, ‘She could off come with us to the skating rink’. This demonstrates that the teacher does not understand either the grammar of the sentence or the correct spelling of the words in the sentence. However, a student in Grade 5 wrote the correct answer and the teacher was very wrong because ‘could have come’ is a compound verb needed for the completion of the sentence and the adverb, adjective, preposition or noun, ‘off’ (Oxford dictionaries 2015. S v off) is incorrect to complete the sentence. It is a bad situation in a Queensland school when students are exposed to wrong questions and the teacher gives an incorrect answer. Christine Jackman addressed the issue of ‘Grammar crimes fuel my rage’ (Brisbane Times, September 7, 2014). She was enraged with Australia’s Immigration Minister, Scott Morrison, for saying on radio that ‘the bottom line that I look at is how many less children are there in detention today than when I became minister…. And the answer is over 530 less’. ‘Fewer!’ is what Christine screeched at the radio when she heard him say this and it was so penetrating that it startled the cat. It’s ‘how many fewer children are there in detention’. Fewer!’. She added: ‘I’m furious. I’m pedantic. I’m old’. There is another grammatical violation that continues in a number of sources. I’m speaking of the nominative case of a pronoun after the verb ‘to be’ or objective case after a preposition. It is not, ‘I am him’ but ‘I am he’. It is not, ‘The dog ran between you and I’ but ‘The dog ran between you and me’. Does that make me a grammatical Nazi? Or is it a grammar Nazi? Fewer versus less: strictly speaking, the rule is that fewer, the comparative form of few, is used with words denoting people or countable things (fewer members; fewer books). Less, on the other hand, is used with mass nouns, denoting things which cannot be counted (less money; less bother). It is regarded as incorrect in standard English to use less with count nouns, as in less people or less words, although this is one of the most widespread errors made by native speakers. It is not so obvious which word should be used with than. Less is normally used with numerals (a score of less than 100) and with expressions of measurement or time (less than two weeks; less than four miles away), but fewer is used if the things denoted by the number are seen as individual items or units (there were fewer than ten contestants). There are serious issues of failings of grammar by a professor, school teacher, students, politicians, and everyday people. It doesn’t seem to bother many people when grammatical errors are made. Why is this? I suggest it is related to a dumbing down of the teaching of grammar in schools. This flows into the mass media and general populace, including the language of politicians and others in the public arena. The consequences can have considerable impact for those who are journalists, teachers, researchers and writers. When people become oblivious to grammatical anomalies, they often will treat grammatical knowledge as trivial. Oxford dictionaries 2015. Oxford University Press. Available at: http://www.oxforddictionaries.com/ (Accessed 6 June 2015). Vonow, V 2015. ‘iPads and mobile phones challenge traditional teaching methods as children learn more outside school’, 5 June. Courier-Mail (online). Available from perthnow at: http://www.perthnow.com.au/news/national/ipads-and-mobile-phones-challenge-traditional-teaching-methods-as-children-learn-more-outside-school/story-fnii5v6y-1227385310568 (Accessed 6 June 2015). I do not know the title of the workbook used, but this is a photographed copy of the page of the book. I have used Google to try to locate the exact wording of these examples, but cannot locate them online. Available at: http://www.brisbanetimes.com.au/comment/my-life-this-week/grammar-crimes-fuel-my-rage-20140906-10cy7o#comments (Accessed 6 June 2015). Ibid., Spencer, September 08, 2014, 7:54AM. Copyright © 2015 Spencer D. Gear. This document last updated at Date: 7 September 2018. This entry was posted in Education, English Grammar on 6 June 2015 by spencer. 1 John 2:22-24King James Version (KJV), ‘22 Who is a liar but he that denieth that Jesus is the Christ? He is antichrist, that denieth the Father and the Son. 23 Whosoever denieth the Son, the same hath not the Father: he that acknowledgeth the Son hath the Father also. 24 Let that therefore abide in you, which ye have heard from the beginning. If that which ye have heard from the beginning shall remain in you, ye also shall continue in the Son, and in the Father’. It was at this point I gave him…. God, the Son, is regarded as God. He has the attributes of deity: (1) Eternity (Jn 1:15; 8:58; 17:5, 24); (2) Omniscience (Jn 4:24; 16:30; 21:17); (3) Omnipresence (Mt 18:20; 28:20; Jn 3:13); (4) Omnipotence. ‘I am the Almighty’ (Rev 1:8); Heb 1:3; Mt 28:18; (5) Immutable (Heb 1:12; 13:8); (6) He does the actions of deity: creator (Jn 1:3; Heb 1:10; Col 1:16); holds things together (Col 1:17; Heb 1:3); forgives sin (Mt 9:2, 6); raises the dead (Jn 6:39-40, 54; 11:25; 20:25, 28); he will be the Judge (Jn 5:22) of believers (2 Cor 5:10), of Antichrist and his followers (Rev 19:15), the nations (Ac 17:31), Satan (Gen 3:15) and the living and the dead (Ac 10:42). Although the words Trinity, Triunity or tripersonality do not appear in Scripture, the teachings do, as I’ve attempted to show. Exact wording should not put us off. Try finding these words in the Bible: Rapture, inerrancy, infallibility, Bible, literal interpretation, Sunday, Christmas, Easter, ‘Jesus is God’, etc. However, all these teachings can be demonstrated from the Bible. The above exposition begins to answer the question: Where does the Scripture command anyone to believe in the Trinitarian God? The God revealed in Scripture and who acted in history as described in Old and New Testaments is the Trinitarian God. The God I worship is no Unitarian or Deist God. He is the Trinitarian Lord God Almighty. When you don’t read my post, you demonstrate ignorance of having a reasonable conversation. I dealt with your Unitarian god by addressing two questions that are coherent with one another. Are we commanded to believe in God? Yes! What is the nature of God we are commanded to believe in? The Trinitarian God of Unity and Trinity. I directly answered your question but what have you done? You have given me a flick pass by your use of a red herring logical fallacy. This fallacy is when you decide not to deal with the issue I raised but to take the conversation in another direction. What you have done is engaged in avoidance of the fact that I DID ANSWER YOUR QUESTION but you DID NOT EXTEND TO ME THE COURTESY OF READING MY POST. You have essentially told me: Don’t waste your time in spending effort on a response to newbirth because he can’t be bothered with answering the issues I raise. He doesn’t even both to read what I write to answer his issues. Newbirth, there is a place on CB [Christianity Board] where you can discuss your heretical view of God. It’s called the Unorthodox forum. That’s where you should be promoting your Unitarianism and not here on an orthodox Christian thread. I need to label this heresy for what it is. It is Unitarianism that is supported by, yes, Unitarians, Jehovah’s Witnesses, Christadelphians, United Pentecostal Church, and others of like minds. Unitarians believe that God is one—one being, one mind, one person, one intelligent agent, and one only, who is supremely wise, powerful, holy, and good, and whose highest attribute is love. This is the one called “Father” by Jesus and his disciples…. As regards God’s indivisible unity. Jesus answered, “The first of all the commandments is, Hear, O Israel; the Lord our God is one Lord” (Mark 12:29); “We know . . . there is no God but one” (1 Cor. 8:4); “God is one” (Gal. 3:20)…. Because there are many texts in the Bible plainly opposed to the Church doctrine of the Trinity. Such are the texts in which the Father is called the one or only God, which could not be said if the Son is also God and the Holy Spirit God: “For though there are many that are called gods, whether in heaven or on earth, (as there are many gods and many lords), to us there is one God, the Father” (1 Cor. 8:5,6); “For there is one God, and one Mediator between God and men, the man Christ Jesus” (1 Tim 2:5)…. Unitarians object to the doctrine of the Trinity, because, while acknowledging the unity of God in words, it subverts that unity in effect. The doctrine divides and distracts the mind in its devotion to God. It defeats the effectiveness of true monotheism, which is to offer us one object of worship, one supreme figure, one person to whom we may ascribe all goodness, in whom is concentrated all our love and vitality, and whose beautiful and venerable nature may pervade all our thoughts (Miano 2003). Miano, D R 2003. An explanation of Unitarian Christianity. American Unitarian Conference (online). Available at: http://www.americanunitarian.org/explanation.htm (Accessed 1 June 2015). For scriptural support for the Nicene Creed, see ‘Great stuff – The Nicene Creed according to Scripture’. The Brothers of John the Steadfast (online). Available at: http://steadfastlutherans.org/2012/06/great-stuff-the-nicene-creed-according-to-scripture/ (Accessed 1 June 2015). This entry was posted in Cults & Heresies, Trinity, Unitarianism on 1 June 2015 by spencer.